We’re ecstatic to announce that Your Name. is up for pre-order now and hitting shelves November 7—and we have a special preview of EVERYTHING in the Your Name. limited edition now! The post “I’ve always been searching…” Your Name. Limited Edition Blu-ray/DVD Preview appeared first on Funimation – Blog!. What is Thy Desire? Outlaw Star is coming to Blu-ray and Collector’s Edition! The post What is Thy Desire? Outlaw Star is coming to Blu-ray and Collector’s Edition! appeared first on Funimation – Blog!. Comments Off on What is Thy Desire? Outlaw Star is coming to Blu-ray and Collector’s Edition! 16 years after its first run on Toonami, Outlaw Star is coming to home video–and for the first time on Blu-ray! From Sunrise (the studio behind Cowboy Bebop), Outlaw Star was one of the most famous space westerns for North American anime fans, bringing a very specific sense of cool with space pirates, bounty hunters, gun shootouts, and a general passion for adventure. This is a series whose humor and story still live up surprisingly well almost 2 decades later, and we’re so excited to present it in glorious HD! Learn how our award-winning Collector’s Editions were designed! Comments Off on Learn how our award-winning Collector’s Editions were designed! Black Lagoon Collector’s Edition Announced at Otakon 2015! Comments Off on Black Lagoon Collector’s Edition Announced at Otakon 2015! Tokyo Ghoul Collector’s Edition Revealed at Otakon 2015! Comments Off on Tokyo Ghoul Collector’s Edition Revealed at Otakon 2015! Free Comic Book Day is here! Get Terrible Lizard #1 and find your local comic shop. The Life After artist Gabo is nominated for a Russ Manning Award! Young adult zombie alternative Junior Braves of the Apocalypse is coming! Ares & Aphrodite‘s Megan Levens speaks with womenwriteaboutcomics and Jacque Nodell on the future of romance comics. Invader Zim’s Aaron Alexovich, Eric Trueheart, Rikki Simons and Megan Lawton speak to CBR about the invasion. 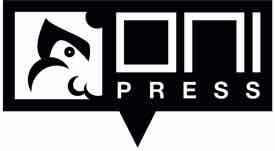 Oni Press Open Submissions Guidelines are here! comicsalliance interviews our editorial team about open submissions with in-depth answers to many of your questions. Terrible Lizard writer cullenbunn​ talks to Diamond about working in comics, FCBD and a girl and her T-Rex. Colorist nathanfairbairn discusses his process in coloring the Scott Pilgrim series, with the final Volume 6 now in stores. Bryan Lee O’Malley speaks with cbr about revisiting and remastering Scott Pilgrim for the sixth color volume. Thanks to stickergiant for all their hard work on our Scott Pilgrim V6 Collector’s Edition stickers! Meteor Men, Mermin Vol 3 and Booger Beard are all recognized with Eisner nominations! Read the first 8 pages of Kaijumax #2 on Bleeding Cool! 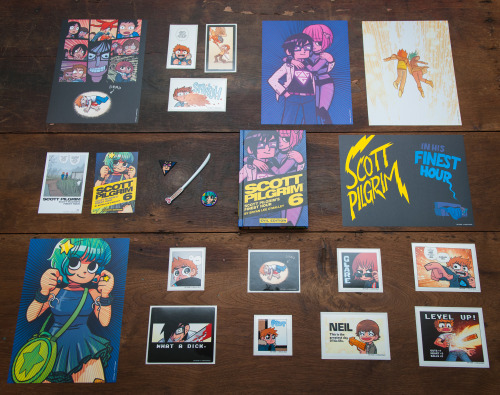 The final color, hardcover edition of Scott Pilgrim is out tomorrow as well as the Collector’s Edition, with everything you see pictured here!